owen wilson | Wanna Catch a Movie? When two married men are granted a week off from marriage by their wives, who are growing increasingly frustrated by their wandering eyes, they think they’ll be getting girls every night. However they soon learn they’re not the good looking teens they used to be and really come to recognise that their fantasies are fantasies for a reason. Funny guy Owen Wilson and equally funny Jason Sudeikis are on a mission to have as many guilty-free affairs as they want for 1 week, yet what unravels in these 7 days are hilarious situations that you could easily see happening with guys like this in real life. With both actors coming from comical backgrounds they have great comedic timing and deliver the jokes and gross-out gags perfectly. The wives are played by Christina Applegate and Jenna Fisher. I mean, they’re good looking, come on! In this respect you’d wonder why any guy would want a hall pass from these women, yet it’s true what they say: you always want what you can’t have. So when the women decide to take the plunge and allow them have the week off, it’s obvious they’re secretly hoping their husbands’ consciences will kick in, what they don’t plan for is a bit of extramarital fun on their side of the bargain too. 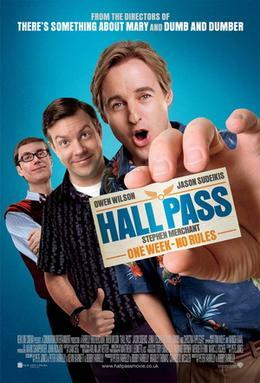 Hall Pass is a funny film, though it isn’t a rom-com or a chick flick, in fact it is more of a guy flick. Being at the hands of the Farrelly brothers (Dumber and Dumber, There’s Something about Mary, The Heartbreak Kid) their humour is very gross-out and more suited to a male audience. I enjoyed it though, so just because they like to have a little more fun with their gags doesn’t make it completely gender specific, but make sure you prepare for a film that guys would lean more towards. Unfortunately I think the gags and humour are a bit weighted. I found myself laughing more in the first half of the film whereas with the second half the focus was drawn more onto the wives and I felt like some of the humour was lost on them. Not that they can’t carry a joke, but Wilson and Sudeikis bounce off each others’ energy so well and make great comedic partners that I think their story should have been the only one being told. Still, it was nice to see the girls give the boys a taste of their own medicine! While the idea behind this film is one that I would never consider in my own relationships, the way it plays out on screen is what I’d hope would come of the situation if it ever came about. But this is Hollywood, right? They like to leave you with a warm fuzzy feeling and a resounding “aww” feeling when the film wraps up, so the latter is a bit predictable. If you’re a fan of the Farrelly brothers, want to watch a funny albeit gross-out type film, or just need a bit of a lighthearted escape, you should give Hall Pass a watch. Directed by Bobby & Peter Farrelly. This entry was posted in Film Reviews - H and tagged 2011, 6/10, christina applegate, farrelly brothers, film review, hall pass, jason sudeikis, jenna fisher, marriage, nicky whelan, owen wilson, richard jenkins, romcom on June 16, 2011 by Jen Horsman.